The Christmas Giving Project embodies the mission and values of Emory Saint Joseph's, which include caring for the poor, vulnerable and those needing assistance. 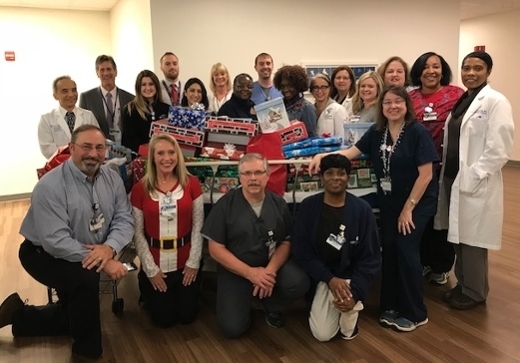 Emory Saint Joseph's Hospital employees demonstrated their generous spirit by adopting 77 local families and donating nearly $47,000 in presents through the hospital's annual Christmas Giving Project. For more than 20 years, this Emory Saint Joseph's tradition has supported families and brought holiday joy to those experiencing financial hardship. The Christmas Giving Project embodies the mission and values of Emory Saint Joseph's, which include caring for the poor, vulnerable and those needing assistance. The majority of families supported are from Mercy Care, a non-profit organization providing primary medical care for the homeless and underserved. Mercy Care was founded after teams of Saint Joseph's doctors, nurses and staff began providing medical care on the streets, in homeless shelters and in soup kitchens. Emory Saint Joseph's also adopted and provided gifts for patients, patients' families and employees and their families facing challenging times during the holiday season. Each family participating in the Christmas Giving Project completed a "wish list" of items. Hospital departments and units adopted families, and employees then signed up to purchase gifts for each individual family member. These gifts included toys, bicycles, clothing, bedding, gift cards and more. "Emory Saint Joseph's employees made this the most successful year ever for the Christmas Giving Project," says Scott Mathewson, Emory Saint Joseph's manager of Non-Invasive Cardiology and Cardiology IT and coordinator of the Project. "We donated nearly $47,000 in presents, setting a record for the highest donation since the Project's inception."